Click the (Gear) icon to open your Overlay Editor’s settings. Go to the Editor tab, then click the button: Go Advanced. For our detailed guide on how to enable Advanced mode, click here. 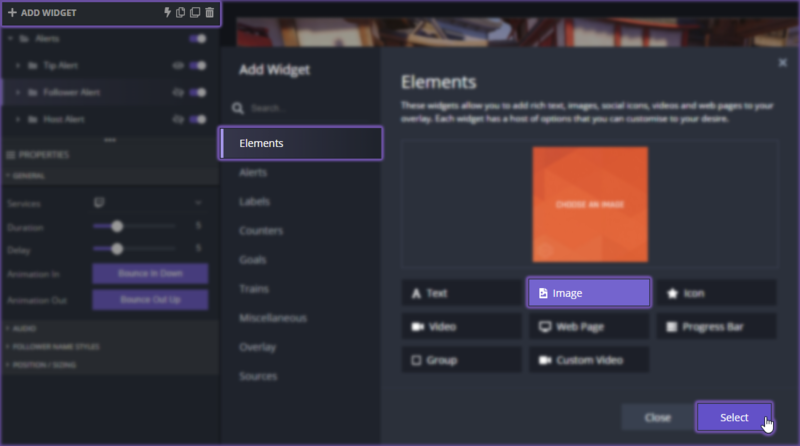 Go to +Add Widget > Elements tab > select Image and then click Select. Here, you can upload your own image or select from our list of images across Player overlays. With your image added to the widgets list, click, hold and drag the custom image to the Alert widget folder. Your image will now appear whenever an alert event occurs. You can test your updated alerts out on the Test Center. Check out our guide here.